Located on the north end of the Las Vegas Strip, Circus Circus Hotel, Casino & Theme Park has been a family favorite for years. With circus acts in the midway, thrilling rides in The Adventuredome and both casual and gourmet dining, this hotel has something for everyone. Inside, the classic casino floor (some areas even still have the original popcorn ceiling) is an adult playground, complete with many table games and numerous slot machines. Overhead, live circus acts — acrobats, trapeze artists, clowns and jugglers — run throughout the day beginning at 11 a.m., and a carnival midway offers games of skill and chance for all ages. Accommodations are affordable and comfortable, including the motel-style manor rooms, which are located separately from the main building with their own interior corridor and security staff. Please keep in mind all rooms are non-smoking; guests who smoke in rooms will be charged a $250 cleaning fee at checkout. A shopping promenade connects all areas of the hotel and houses several restaurants, including THE Steak House, a highly touted gourmet room serving Midwestern beef dry-aged to perfection. 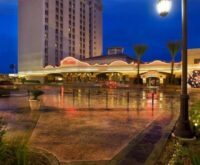 Throughout the property there are more than a handful of places to grab a quick bite or cup of coffee (such as the Pizzeria, the West Side Deli and Blue Iguana Mexican Express), while the casino is home to an enormous buffet. Mötley Crüe front man Vince Neil has opened Vince Neil’s Tatuado Eat-Drink-Party! restaurant and Vince Neil’s Party Bus Bar at Circus Circus. They showcase the rock star’s love of tattoos and tequila in an atmosphere reminiscent of the legendary Sunset Strip rock clubs where Neil and his pals launched their paths to stardom. Circus Circus also touts the largest space-frame dome in the United States, The Adventuredome, an indoor theme park featuring the Canyon Blaster, a double-loop, double-corkscrew roller coaster, guaranteed to make you scream. The new El Loco, featuring a 72-second ride with gravity-defying turns and over-the-edge twists, provides a heart-dropping thrill as well. An intimate race and sports book, pools and a unique rotating carousel-like snack bar round out the experience and should serve to reinforce any desire to run away and join the circus. A Las Vegas institution, Circus Circus is one circus that’s always in town. There is valet and self-parking. Valet fees: $10 for 0 to 4 hours; $15 for 4 to 24 hours. Self parking will still be free. However, guests visiting other MGM Resort International properties will still have to pay self-parking fees.The parking fee for registered hotel guests includes in-out privileges within the same parking type (self or valet) across all MGM Resorts hotels (subject to availability). I stayed at the Circus Circus Hotel and Casino for a week. First off the website pictures are unreliable as to what the rooms look like now. The hotel needs some serious deep cleaning and updating and better housekeeping staff. I get you’re trying to save time but who doesn’t change the sheets in guests rooms? We come to get away from our daily lives not to worry about if the hotel staff is doing their job. I have never scratched so much in my life. I tried to stay out the room as much as possible and even if they offered me a free stay, I wouldn’t take it. I give it one star only for convenience to other places on the strip.